Molenda, M. (2008). The Programmed Instruction Era: When effectiveness mattered. TechTrends, 52(2), 52-58. Programmed instruction (PI) was devised to make the teaching-learning process more humane by making it more effective and customized to individual differences. B.F. Skinner’s original prescription, although it met with some success, had serious limitations. Later innovators improved upon the original notion by incorporating more human interaction, social reinforcers and other forms of feedback, larger and more flexible chunks of instruction, and more attention to learner appeal. Although PI itself has receded from the spotlight, technologies derived from PI, such as programmed tutoring, Direct Instruction, and Personalized System of Instruction have compiled an impressive track record of success when compared to so-called conventional instruction. They paved the way for computer-based instruction and distance learning. The success of the PI movement can be attributed largely to the commitment of its proponents to relentless, objective measurement of effectiveness. During the first half of the 20th century, research and theory in American psychology tended to revolve around the perspective of behaviorism, and Thorndike’s (1911) theorems—the law of recency, the law of effect, and the law of exercise—remained at the center of discussion for decades. In the 1920s Sidney Pressey, a psychology professor at Ohio State University, invented a mechanical device based on a typewriter drum, designed primarily to automate testing of simple informational material (1926). As he experimented with the device he realized that it could also provide control over drill-and-practice exercises, teaching as well as testing. In explaining why his device was successful he explicitly drew upon Thorndike’s laws of recency, effect, and exercise as theoretical rationales (Pressey, 1927). Unfortunately, despite the fact that Pressey continued to develop successful self-teaching devices, including punchboards, that had all the qualities of later “teaching machines,” his efforts were essentially a dead end in terms of a lasting effect on education. However, Pressey lived and worked long enough to participate in the discussions surrounding the new generation of teaching machines that came along in the 1950s. The movement that had a more enduring impact on education and training was animated by a reframing of Thorndike’s behaviorist principles under the label of radical behaviorism. This school of thought proposed a more rigorous definition of the law of effect, adopting the term reinforcer to refer to any event that increases the frequency of a preceding behavior. Operant conditioning, the major operationalization of this theory, involves the relationships among stimuli, the responses, and the consequences that follow a response (Burton, Moore & Magliaro, 2004, p. 10). The leading proponent of radical behaviorism, B.F. Skinner, demonstrated that by manipulating these three variables experimenters could elicit quite complex new behaviors from laboratory animals (Ferster & Skinner, 1957). Having analyzed the deficiencies of group-based traditional instruction, Skinner (1954) proceeded to develop a mechanical device (shown in Figure 1) that could overcome the limitations of lock-step group presentation, replacing it with individually guided study in which the contingencies of reinforcement could be carefully controlled. In Skinner’s new format the content was arranged in small steps, or frames, of information. These steps lead the learner from the simple to the complex in a carefully ordered sequence, and, most importantly, at each step the learner is required to make a response—to write or select an answer. The program then judges whether the response is correct. The theory dictated that the learner should then receive some sort of reinforcer if the response were correct. In Skinner’s method, the reinforcer took the form of “knowledge of correct response,” that is, telling the learner the right answer or confirming that they got the right answer. The main purpose of the mechanical elements of the system was to ensure that users could not peek ahead at the correct answers. The next step in the sequence could only take place after a response was written inside a little window frame and a lever pulled to cover the learner’s response with a transparent cover while revealing the correct answer. The device, referred to by others as a teaching machine, soon gained national attention and attracted a following of eager software authors. Figure 1. A teaching machine of the Skinner type. Used with permission of AECT, successor to DAVI. 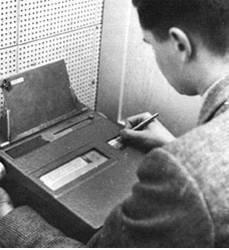 The instructional format used in teaching machines became known as programmed instruction (PI), and this new technology became a popular subject of educational research and development by the late 1950s. Within a few years developers were dispensing with the elaborate mechanical apparatus, instead relying on users (rightly or wrongly) to discipline themselves and refrain from peeking ahead at the correct answer. Thus PI lessons could be published in book format, with short instructional units (“frames”) followed by a question, with the correct answer lower on the page (to be covered up by the user) or on the next page. Released from the necessity of providing hardware along with the software, publishers rushed to produce books in programmed format. They offered programmed books that appealed to mass audiences, such as Goren’s Easy Steps to Winning Bridge (1963) by the famous bridge master Charles Goren, and those that aimed at the school market, such as English 2600 (Blumenthal, 1961), which taught the fundamentals of grammar in a step-by-step linear program, illustrated in Figure 2. Figure 2. Example of page layout of a linear programmed instruction book: English 3200 by Joseph Blumenthal, New York: Harcourt Brace & World, 1962. The original programs devised by B.F. Skinner and his followers led users through a pre-specified sequence of small steps. Shortly after Skinner’s invention, Norman Crowder introduced a variation that was not founded on any particular theory of learning, but only on practicality. It featured a more flexible programmed lesson structure that allowed learners to skip ahead through material that was easy for them or to branch off to remedial frames when they had difficulty. Crowder (1962) labeled his method intrinsic programming, but it was quickly dubbed branching programming because a schematic outline of the program resembled a tree trunk (the prime path) with multiple branches (the remedial sequences). Skinner’s method was thereafter known as linear programming. The two approaches are contrasted in Figure 3. Figure 3. 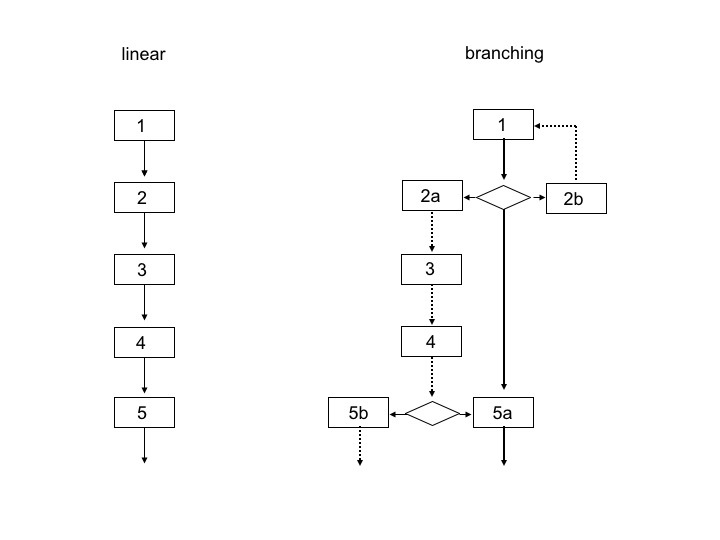 Comparison of the organization of a linear vs. branching programmed text. © Michael Molenda. Used with permission. Initially, Crowder’s programs were incorporated into the AutoTutor, a desktop teaching machine which used his branching technique to tailor the lesson to the responses of the learner. The original AutoTutor, released in the early 1960s, provided individualized instruction long before general-purpose desktop computers were feasible. But Crowder also joined the rush to convert programs to book form. His TutorText series became one of the best-known series of programmed materials. 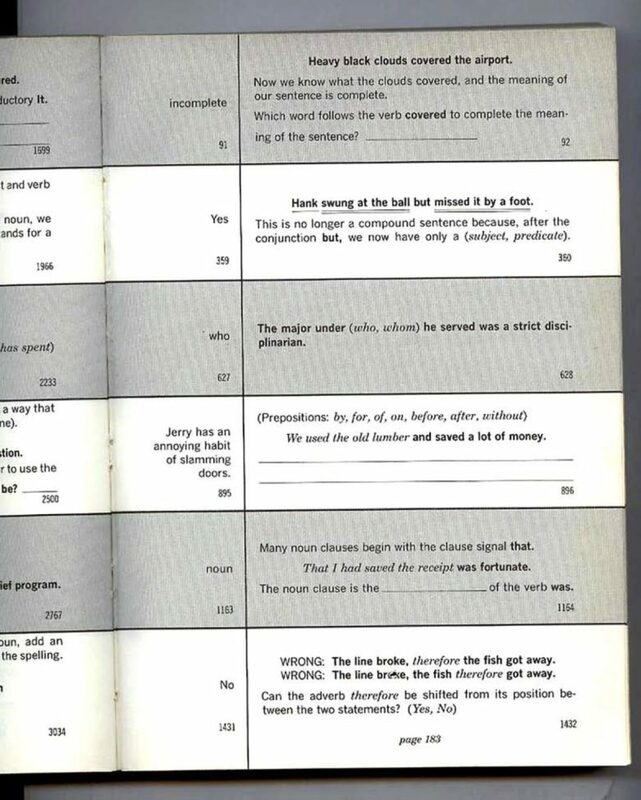 In the print format, readers encountered multiple-choice questions and each alternative answer led to a different “next page” in the book. PI was first employed in formal education in the college courses taught by Skinner and his colleagues in the late 1950s. Experiments in schools began with teaching spelling to second- and third-graders in 1957 and teaching mathematics in high schools in 1959 (Saettler, 1990, p. 297). Large-scale school implementation projects were conducted in the early 1960s in Denver and Long Island, NY. The major lesson learned in these experiments was that although the materials themselves were effective, PI could not make a substantial impact on the efficiency or effectiveness of schooling without extensive restructuring of classroom routines and school organization. Schools then, as now, were resistant to systemic restructuring (Saettler, 1990, pp. 297-302). Authors and publishers unleashed a flood of programmed materials both in linear and branching formats. Between the early 1960s and 1966, new titles proliferated at an accelerating rate as publishers vied with each other for market dominance. 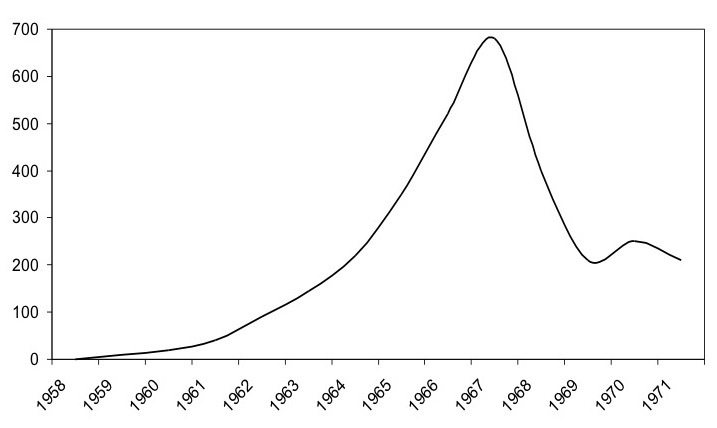 Figure 4 illustrates this boom, showing the growth curve of programmed materials in the United Kingdom, which was paralleled in the U.S. As with other technological innovations, the upward slope did not continue indefinitely. After 1966 the publication of new titles declined rather rapidly and then leveled off. Although there is little fanfare today, programmed materials are still distributed and used by learners, many of whom continue to feel empowered by the ability to work through material methodically with frequent checks for comprehension. Figure 4. Number of programmed instruction titles available in the market each year in the United Kingdom. Adapted from Figure 1 in Hamer, J.W., Howe, A. & Romiszowski, A.J. (1972). Used with permission of SEDA, successor to APLET. One of the major tenets of PI was that learners should practice mainly correct responses, so that they could experience frequent reinforcement. The only way of assuring this was to test and revise each program during development. In fact, developmental testing was a mandatory specification for materials destined for the military training market. The US Air Force required that “at least 90% of the target population will achieve 90% of the objectives” (Harris, p. 142). This was known as the 90/90 criterion and was widely accepted as the standard benchmark of effectiveness. One of the consequences of this practice was to promote the flowering of a systematic procedure for designing, testing, and revising programmed materials, a precursor to later instructional design models. Another consequence was to encourage an empirical, data-based approach to instruction, since each PI development project was similar to a controlled experiment. The professional literature of the 1960s carried hundreds of reports on testing of PI programs and comparisons of programmed treatments with other sorts of treatments. One of the first casualties of this research was Skinner’s set of specifications. Small steps did not prove to be essential, nor linear sequencing…as demonstrated by Crowder’s branching method. The immediacy of reinforcement did not prove to be critical for a great many types of learning tasks. Indeed, the efficacy of “knowledge of results” as a reinforcer did not stand up under scrutiny. In retrospect, it was predictable that “knowledge of correct response” would not work as a universal reinforcer. Researchers (and lay people) already knew that different people respond to different reinforcers at different times. When a person is satiated with ice cream, ice cream is no longer reinforcing. The same is true of being told the correct answer. At some point curiosity is satiated. Researchers rediscovered that there are no universal reinforcers. Interestingly, even though the individual hypotheses making up PI did not prove to be robust, experiments comparing PI to so-called conventional instruction (a construct that needs to be critically deconstructed in its own right!) tended to show PI as superior (Walberg, 1984; Ellson, 1986). Why was that? In retrospect, we can surmise that PI did have several advantages over so-called conventional instruction. First, in many educational experiments, the experimental treatment simply received more time and effort in its preparation and delivery. Second, users are often attracted to the novelty of any new treatment—at least until the novelty wears off. Finally, the PI treatments not only had more time and attention, they were designed through a rigorously thought-out, systematic process, which included not only precise specification of objectives but also testing, revision, and re-testing. Indeed, it was the realization that the design process was the valuable part of programmed instruction that led to the emergence of systematic instructional design as a powerful tool (Markle, 1967). It was not inevitable that PI would become a factor in the field then known as audiovisual (AV) communications, represented by AECT’s predecessor, the Department of Audio-Visual Instruction (DAVI), a unit of the National Education Association. In the late 1950s and early 1960s DAVI was enjoying a growth spurt stimulated, first, by the mushrooming of new schools in the post-World War II expansion period and, second, by the largest ever federal infusion of money into public education, the National Defense Education Act (NDEA) of 1958. Schools and colleges, like the rest of American society, lived under the shadow of the Cold War, and the feeling of a life-or-death struggle with the Soviet Union was palpable. With the Soviet launch of Sputnik I in 1957, America confronted the prospect of a dangerous technological inferiority. Education—especially in mathematics, science, and engineering—became an urgent priority. The DAVI community benefited from the reinvigorated march to expand and improve education through the NDEA. New educational media became the hot topic of ramped-up research and development activity as well as the beneficiary of enhanced school-equipment budgets. Attendance at DAVI conventions zoomed from the hundreds to the thousands as school AV administrators, many newly assigned, flocked to see and buy the new hardware and software exhibited there: film, slide and filmstrip, phonograph and audio tape, opaque and overhead projection, radio, and television (Godfrey, 1967). 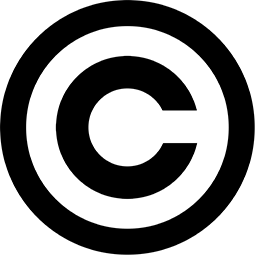 The 1959 DAVI convention program was primarily devoted to these audiovisual media. It had a single research paper devoted to PI, “Teaching Machines and Self-Instructional Materials: Recent Developments and Research Issues,” but by 1960 there were several sessions devoted to PI, including a major one entitled “Programmed Instructional Materials for Use in Teaching Machines” (Sugar & Brown, n.d.). This title gives a clue to the connection between AV administrators and PI: mechanical devices were initially used to deliver the programmed lessons. When schools and colleges acquired teaching machines someone had to take care of them. Who was more suited to this task than the AV coordinator who already took care of film, filmstrip, slide, and overhead projectors? The focus on hardware is indicated by the name that marked this new special interest group at the next several DAVI conventions: the Teaching Machine Group. DAVI’s commitment to this new phenomenon was signaled by the publication of a collection of key documents on PI (Lumsdaine & Glaser) in 1960, and then a follow-up compilation of later research and commentary in 1965 (Glaser). Attention at the annual DAVI convention grew; by the late 1960s the convention offered about a dozen sessions a year on PI, representing about a one-tenth share of the stage. The conversation was still predominantly about AV media, but PI had a visible, sustained presence. PI was even more visible in scholarly circles, as indicated by Torkelson’s (1977) analysis of the contents of AV Communication Review, which showed that between 1963 and 1967 the topics of teaching machines and programmed instruction represented a plurality of all articles published in that journal. DAVI was not the only, or even the primary professional association interested in PI. When Air Force experiments in 1961 demonstrated the dramatic time and cost advantages of PI (efficiency as well as effectiveness) military trainers and university researchers quickly formed an informal interest group, which by 1962 became a national organization, the National Society for Programmed Instruction (NSPI). The organization grew to encompass over 10,000 members in the U.S., Canada, and forty other countries. As the interests of members also grew and evolved to include all sorts of technological interventions for improved human performance, the name, too, evolved to its current form, International Society for Performance Improvement (ISPI). Gradually, throughout the 1960s the central focus of the field was shifting from the production and use of AV materials to designing and utilizing interactive self-instructional systems. B.F. Skinner coined the term technology of teaching in 1968 to describe PI as an application of the science of learning to the practical task of instruction. Other authors used the term educational technology; an early example being Educational technology: Readings in programmed instruction (DeCecco, 1964). This idea supported the notion promoted by James D. Finn (1965) that instructional technology could be viewed as a way of thinking about instruction, not just a conglomeration of devices. Thereafter, more and more educators and trainers came to accept soft technology, the “application of scientific thinking” as well as hard technology, the various communications media. And when the time came to reconsider the name of the association in the late 1960s, one of the names offered to the membership for vote combined elements of both. The vote in June 1970 showed a three-to-one preference for the hybrid name, Association for Educational Communications and Technology (AECT). Over the decades since Sidney Pressey’s and B.F. Skinner’s bold innovations in self-instruction, many other concerned educators have tried their hands at improving upon the format initially incorporated into teaching machines. Obviously, computer-assisted instruction was heavily influenced by PI. In addition, a number of other technological spin-offs from PI have gone on to chart a record of success in improving the effectiveness of education. Three will be examined in some detail—programmed tutoring, Direct Instruction, and Personalized System of Instruction. A psychology professor at Indiana University, Douglas Ellson, had a life-long consuming interest in improving the teaching-learning process. He examined PI very closely, detected its weaknesses, and in 1960 developed a new approach to address those weaknesses (Ellson, Barber, Engle & Kampwerth, 1965). Programmed tutoring (PT) puts the learner together with a tutor who has been trained to follow a structured pattern for guiding the tutee. Like PI, students work at their own pace and they are constantly active—reading, solving problems, or working through other types of materials. The tutor watches and listens. When the tutee struggles to complete a step, the tutor gives hints, taking the learner back to something he already knows, then helps him to move forward again. Thus, learners are usually generating their own answers. And instead of receiving “knowledge of correct response” as reinforcement, they receive social reinforcers from the tutor—praise, encouragement, sympathy, or at least some attention. Of course, giving every student a tutor is a labor-intensive proposition, but Ellson solved this problem by using peersas tutors—students of the same age or a little older, a role they proved able to play after a little training in how to follow the specified procedures. Not only did tutors serve as “free manpower,” but research showed that it was a win-win situation because tutors showed learning gains even greater than the tutees’! By going through the material repeatedly and teaching it to someone else, they strengthened their own grasp of the material. During the early 1980s PT gained credibility due to its track record in comparison studies (Cohen, J.A. Kulik & C. C. Kulik, 1982 ). It was recognized by the U.S. Department of Education as one of the half-dozen most successful innovations and it was widely disseminated (although not as widely as it deserves, as with many of the other soft technologies that have been developed over the years). lessons developed through extensive testing and revision. DI has been extensively used and tested since the 1960s. A large-scale comparison of twenty different instructional models implemented with at-risk children showed DI to be the most effective in terms of basic skills, cognitive skills, and self-concept (Watkins, 1988). More recently it has been found to be one of three comprehensive school reform models “to have clearly established, across varying contexts and varying study designs, that their effects are relatively robust and … can be expected to improve students’ test scores” (Borman, Hewes, Overman & Brown, 2002, p. 37). My goal for years has been to do things that are productive and that help make life better for kids, particularly at-risk kids. I don’t consider myself a kinderphile…. For me it’s more an ethical obligation. Certainly kids are enchanting, but they also have a future, and their future will be a lot brighter if they have choices. We can empower them with the capacity to choose between being an engineer, a musician, an accountant, or a vagrant through instruction (Engelmann, n.d.). They welcomed empirical testing of their products and demanded it of others. Instruction that was wasting students’ time or grinding down their enthusiasm was simply malpractice. Their legacy lives on, mainly in corporate and military training, where efficiency and effectiveness matter because savings in learning time and learning cost have direct bearing on the well-being of the organization. As public purse strings tighten, the day may come when learning time and learning costs are subjected to close accountability in public school and university education also. 1. Think about Programmed Instruction, Programmed Tutoring, Direct Instruction, and Personalized System of Instruction. What type of instruction would you prefer to receive? What type would you prefer to give? 2. What aspects of Skinner’s programmed instruction are still used in instructional design today? Blumenthal, J.C. (1961). English 2600. New York: Harcourt. Borman, G.D, Hewes, G.M., Overman, L.T. & Brown, S. (2002). Comprehensive school reform and student achievement: A meta-analysis. Report No. 59. Baltimore, MD: Center for Research on the Education of Students Placed at Risk (CRESPAR), Johns Hopkins University. Burton, J.K., Moore, D.M., & Magliaro, S.G. (2004). Behaviorism and instructional technology. In D.H. Jonassen (Ed. ), Handbook of research on educational communications and technology (2nd ed., pp. 3-36). Mahwah, NJ: Erlbaum. Cohen, P.A., Kulik, J.A. & Kulik, C.C. (1982, Summer). Educational outcomes of tutoring: A meta-analysis of findings, American Educational Research Journal 19:2, 237-248. Crowder, N.A. (1962). Intrinsic and extrinsic programming. In J. E. Coulson (Ed. ), Programmed learning and computer-based instruction (pp. 58-66). New York: Wiley & Sons. Ellson, D.G. ; Barber, L; Engle, T.L & Kampwerth, L. (1965, Autumn). Programed tutoring: A teaching aid and a research tool. Reading Research Quarterly, I:1, 77-127. Ellson, D.G. (1986). Improving the productivity of teaching: 125 exhibits. Bloomington, IN: Phi Delta Kappa. Engelmann, S. (n.d.). Possibly way more than you ever wanted to know about me Siegfried (Zig) Engelmann 2005. Retrieved July 24, 2007 at http://www.zigsite.com/about.htm. Finn, J.D. (1965). Instructional technology. Audiovisual Instruction 10:3 (March), 192-194. Glaser, R. (Ed.). (1965). Teaching machines and programmed learning II: Data and directions. Washington DC: Department of Audiovisual Instruction, National Education Association. Godfrey, E.P. (1967). The state of audiovisual technology, 1961-1966. Monograph No. 3. Washington DC: DAVI, National Education Association. Goren, C.H. (1963). Goren’s easy steps to winning bridge: Programmed textbook, self-tutoring course. New York: Franklin Watts. Hamer, J.W., Howe, A. & Romiszowski, A.J. (1972). Changes in the pattern of programmed materials available commercially in Britain. In K. Austwick & N.D.C. Harris (Eds.) Aspects of educational technology, Volume VI. London: Pitman. Harris, R.F. (1964). Programmed instruction at Chanute AFB, Illinois. In G.D. Ofiesh & W.C. Meierhenry (Eds.) Trends in programmed instruction. Washington DC: Department of Audiovisual Instruction, National Education Association. Keller, F.S. (1968). Goodbye teacher…Journal of Applied Behavior Analysis, 1, 78-79. Keller, F.S. (1974). The history of PSI. In F.S. Keller and J.G. Sherman (Eds. ), The Keller Plan handbook. Menlo Park, CA: W.A. Benjamin, Inc.
Keller, F.S. (1977). Summers and sabbaticals: Selected papers on psychology and education. Champaign, IL: Research Press Company. Kulik, J.A., Kulik, C.C., & Cohen, P.A. (1979). A meta-analysis of outcome studies of Keller’s personalized system of instruction. American Psychologist 34, 307-318. Lumsdaine, A.A. & Glaser, R. (Eds.). (1960). Teaching machines and programmed learning: A source book. Washington DC: Department of Audio-Visual Instruction, National Education Association. Markle, S.M. & Tiemann, P.W. (1967). Programming is a process. Sound filmstrip. Chicago: University of Illinois at Chicago. Pressey, S.L. (1926). A simple apparatus which gives tests and scores – and teaches. School and Society, 23 (586), 373-376. Skinner, B.F. (1954). The science of learning and the art of teaching. Harvard educational review 24, 86-97. Skinner, B.F. (1968). The technology of teaching. New York: Appleton-Century-Crofts. Sugar, W. & Brown, A. (n.d.) AECT conference program analysis 1957-2006. Retrieved August 28, 2007 from http://lsit.coe.ecu.edu/sugar/AECT_program.html. Thorndike, E.L. (1911). Animal intelligence. New York: Hafner. Torkelson, G.M. (1977). AVCR–One quarter century: Evolution of theory and research. AV Communication Review,25(4), 317-358. Vargas, J.S. (n.d.). Brief biography of B.F. Skinner. Retrieved from website of B.F. Skinner Foundation August 15, 2007 at: http://www.bfskinner.org/briefbio.html. Walberg, H. J. (1984, May). Improving the productivity of America’s schools. Educational Leadership 41 (8), 19-27. Watkins, C.L. (1988). Project Follow Through: A story of the identification and neglect of effective instruction. Youth Policy 10(7), 7-11. Is Programmed Instruction Still Relevant Today? Hack Education [http://teachingmachin.es/] is a collection of essays by Audrey Watters that discuss the fascination in our field and society with automizing teaching and learning, from Skinner’s teaching machines to modern day MOOCs. Can you think of any other examples of the principles of Programmed Instruction still being discussed today?